Ever since I saw this home tour, I've had pink doors on my mind. I'm working to get out of my monochrome rut - both in my home and in my wardrobe - but I always gravitate towards black. With a colorful rug going into the guest room, I'm using this room renovation as an opportunity to play with color and see where it takes me. A step out of my comfort zone, but what could go wrong? Probably the most famous pink door is the #thatpinkdoor in Palm Springs. In fact, it's so famous that the owners had to post a "no photography" sign in their front yard to ward away bloggers and media. It's some real pink inspo. 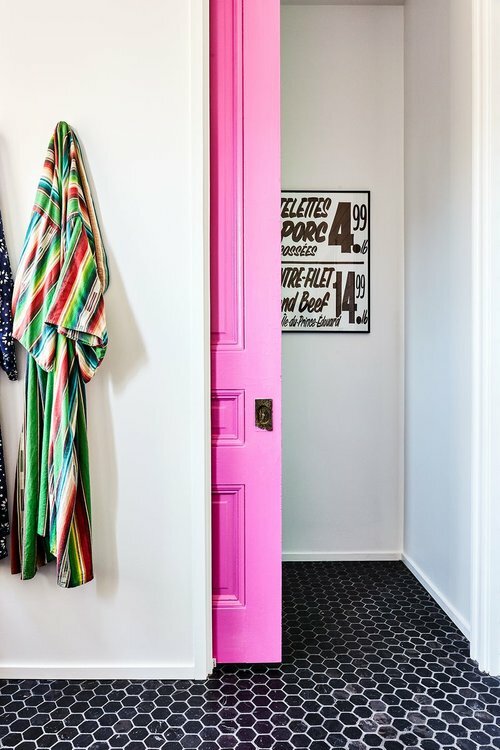 Like the home owners in the Curbed article I mentioned earlier, I'm going to go with Sherwin-William's Haute Pink for the guest room door. If it goes well, it might make its way over to the bathroom door, as well, although this is color to be used in moderation.